Virtually all large U.S. companies provide long-­‐term incentives (LTIs) through equity-­based awards, which provide economic alignment with the company’s shareholders. While most companies use performance-­‐based equity awards, there also may be a role for “Career Shares”. Career Shares, which are restricted stock units (RSUs) that cannot be transferred for many years (such as after retirement), may have a role in providing a career-­‐ oriented pay element to key executives. The concept of Career Shares is not new. For many years, a few companies have made large (e.g., $1 million plus), periodic Career Share grants to selected executives. However, in recent years, some companies have structured Career Share grants to be more shareholder-­‐friendly through smaller annual grants, including designing awards similar to retirement plans. 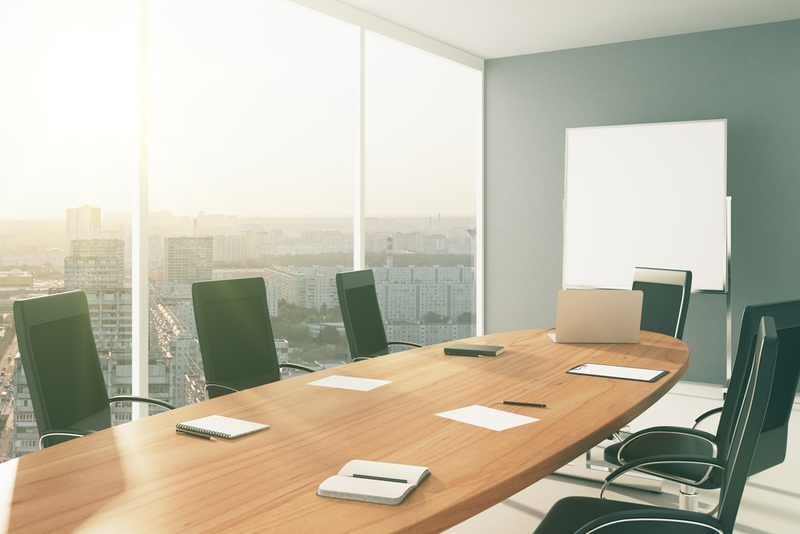 Many companies regularly grant RSUs (or restricted stock) to senior executives as part of their annual long-­term incentive program. These RSU grants typically represent a minority (e.g., 25%) of the regular LTI grant mix and vest after three years. This approach creates executive owners as there are three unvested grants outstanding at one time which also helps with executive retention. 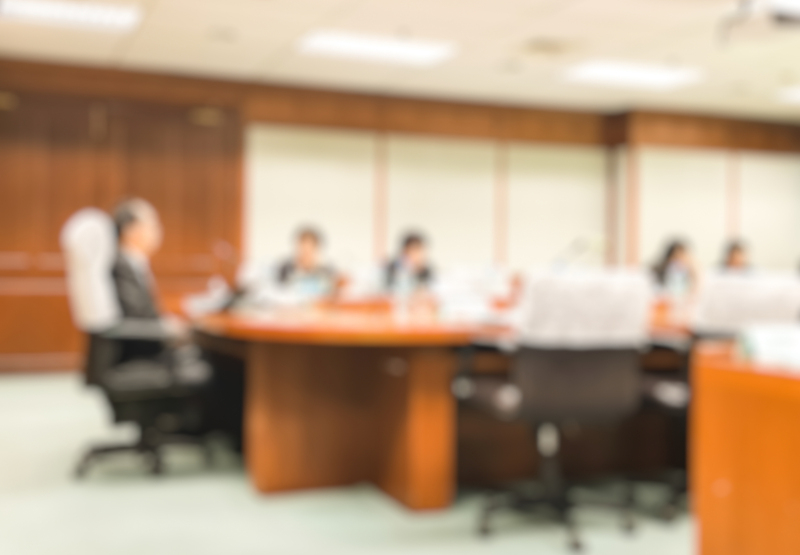 The consideration of Career Shares may be particularly relevant today, as such grants provide long-­term alignment with shareholders while helping to attract and retain key executives. In each role, Career Shares have a key advantage over cash and time-­‐based equity grants (as commonly designed), since they provide an ongoing tie to shareholders over a longer period or spanning an executive’s entire career with a company. Below we focus on Career Shares as part of a company’s executive retirement benefit program. In considering the provision of supplemental executive retirement benefits, Career Shares can provide better shareholder optics since the ultimate value of the retirement benefits is tied to the company’s stock price over an executive’s career. 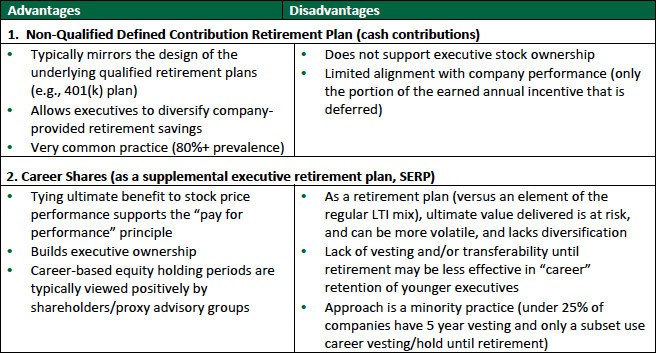 The table below compares key attributes of a common defined contribution supplemental executive retirement benefit design and a Career Shares retirement plan. In considering implementing new additional retirement benefits for executives, the key advantage of Career Shares is that the share units have a direct tie to shareholders, unlike the typical defined contributions accounts that receive cash contributions with interest/market returns credited over time. This can be particularly important if Career Shares are an addition to the total pay package, rather than a carve-­‐ out/reduction of a current pay element. Key Features of "Career Share SERPs"
Shareholder alignment - Contributions can vary with company performance and the ultimate value is linked to the stock price / TSR. Flexible design - Participation, normal and early retirement age, payout terms, etc. can be defined based on the talent strategy and competitive needs. Selective participation - Eligibility and actual participation in a specific year's grants is typically selective and limited to senior executives. 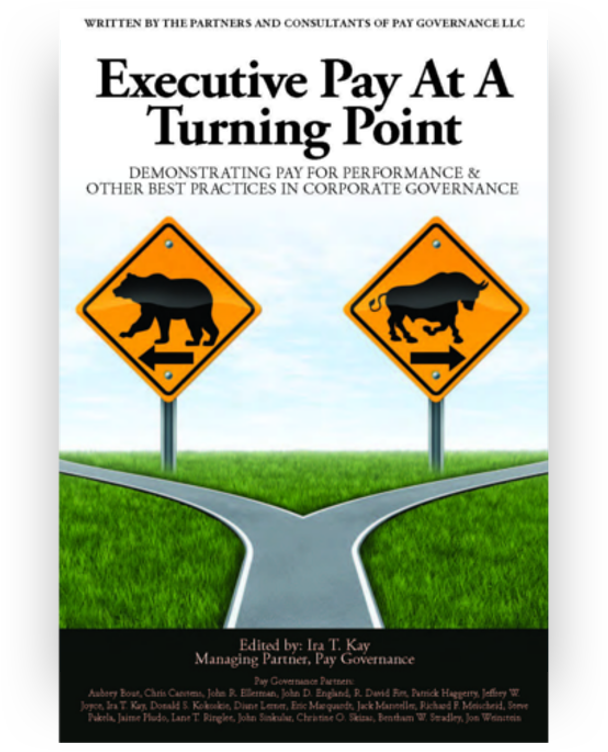 If proxy-named executive officers participate, it is important to ensure the Career Share grant levels result in a strong pay-performance relationship and reasonable overall LTI mix (since Career Share awards, in the year of grant, are typically reported in the Summary Compensation Table in the Stock Awards column). Share ownership - Share equivalents credited to executives are a form of share ownership that can exert a powerful influence for executives to think and act like owners. Career Share SERP design in flexible with the ultimate design customized to a particular company's objectives and talent needs. While the original use of Career Shares involved large upfront awards that were infrequently granted, there may be compelling reasons to instead use annual grants of Career Shares. Compared below are annual and periodic grant frequencies, which could be used for providing retirement benefits (as well as if Career Shares are used to help recruit key executives or other situations). The potential value of additional annual RSU grants can be substantial over an executive’s career. 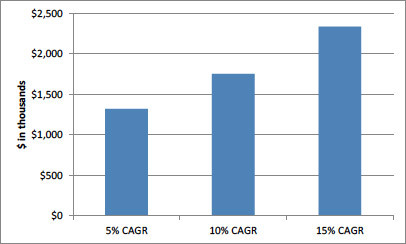 Below is an illustration of the potential future value of 10 years of annual RSU awards with a grant-­‐date value of $100,000 per year (shown at three levels of annual stock price appreciation). 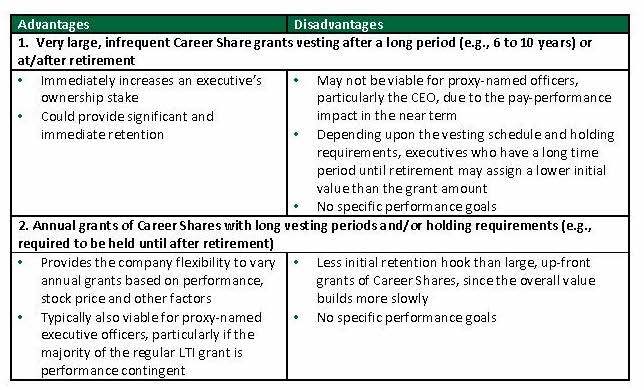 There may be a role for Career Share grants in your company’s executive pay program, particularly as part of aligning at least a portion of retirement benefits to long-­‐term shareholder value. 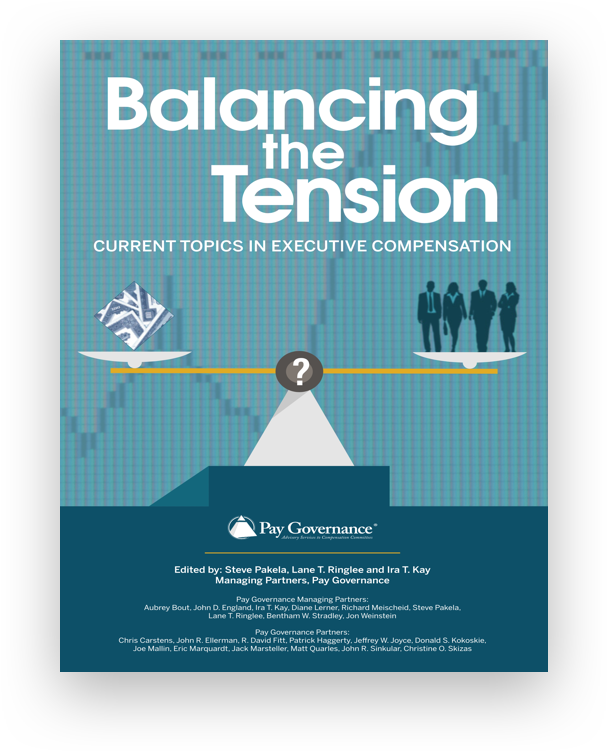 As with any pay element, a holistic view should be applied considering the company’s business and talent needs, current pay opportunities and programs, proxy disclosure implications and other factors. Click here to view a printable version of this Viewpoint.